Since I first launched my Invincible Stabber, it has proven completely invulnerable to all of the attacks made against it. Attempts to suicide gank me have declined in recent days; I wrote about the most recent gank attempts earlier this month. For every suicide attack that gets carried out, there are several other plots that get thwarted before they ever get past the planning stages. That's the power of my intel network. Thanks to the powerful draw of the New Order ideology, I am equipped with the eyes and ears of many an Agent throughout EVE. So many, in fact, that I had to create a label for blog posts about their "Intel". When it's appropriate to declassify intel brought to me by my little birds, it gets posted here for all to see. Today I would like to share some fresh intel, courtesy of my Agents. One of my birds sang me a song about Reddit. Among the most popular sites on the internet, Reddit is a message board that gets millions of hits per day. It is best known for its up-vote, down-vote system in which the most highly-rated threads and comments go to the top, as opposed to the most recent ones. Reddit is primarily a vehicle for sharing photographs of kittens and quotes from famous atheists, but there are also countless subforums (called "subreddits") about all kinds of different topics. For those familiar with nullsec politics, the formidable TEST alliance was born from the EVE subreddit. However, TEST's parent corp created its own subreddit; the main EVE subreddit still feels its influence but is independent and is read by pilots from across EVE. Yesterday, I was plying my trade in Kino, which is fast getting a reputation for its rebelliousness and contemptuous attitude toward the New Order. Unbeknownst to me, a Kino miner went to the EVE subreddit to ask for help. 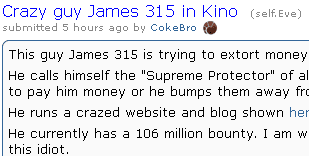 This guy James 315 is trying to extort money from miners in kino, in his "Invincible Stabber". He calls himself the "Supreme Protector" of all the systems he frequents and trys to get everyone to pay him money or he bumps them away from the ice they are mining. He runs a crazed website and blog shown here. He currently has a 106 million bounty. I am willing to pay ANYONE another 100 million to come kill this idiot. 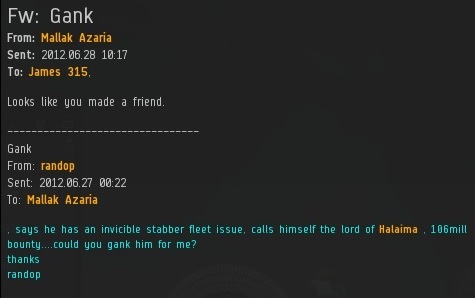 His attempt to hire an assassin to kill me for 100 million isk did not go as he expected. Instead of rallying to his cause, the redditor found that his people overwhelmingly supported me! Redditors proudly standing in favor of the New Order were quickly up-voted to the top of the comment stack. Meanwhile, instead of signing up a contract killer, the author of the thread found himself repeatedly down-voted. After a few hours, the thread picked up steam. The author soon realized he had gone to the wrong place to ask for help, so he deleted the thread. This erased the thread from the subreddit so it could no longer be easily accessed, but Reddit keeps a permanent copy of all threads: They can still be viewed if you have the URL. Thankfully, my Agents were already on top of things, so they copied the thread URL and took a screenshot of the original post while the author's name was still visible. You can read the full thread at this link. Once again, I have no fear of anyone who spreads word of the New Order to the masses, even if that person is biased against me. I am absolutely confident that anyone who comes into contact with our ideas will naturally be predisposed toward them, regardless of how they're packaged. Remember when the Kino miners started linking this website in local? The New Order continues to be the "strong horse" that people recognize, whether here, on Reddit, on EVE-O, anywhere!